Upgrade to a new Galaxy phone and save when you trade in your current device. After selecting your Galaxy phone, select an eligible trade-in device in cart. Follow the simple steps to determine your trade-in value. Remove Clicking remove will cancel your trade-in selection. * Certain conditions apply. 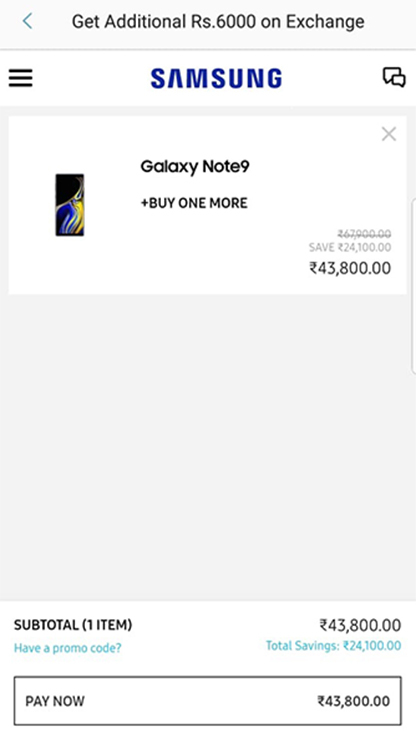 Price is based on purchasing an eligible Samsung Galaxy S10 128GB (our regular price: $1259.99) device at http://www.samsung.com/ca/ or a Samsung Experience Store in Canada until April 30, 2019. Trading in a Galaxy S8+ through the Samsung.com/ca/ trade-in process will provide a trade-in value of $200 that combined with the credit of $200 on a Samsung Galaxy S10, will be a saving of $400, reducing the price to $859.99. 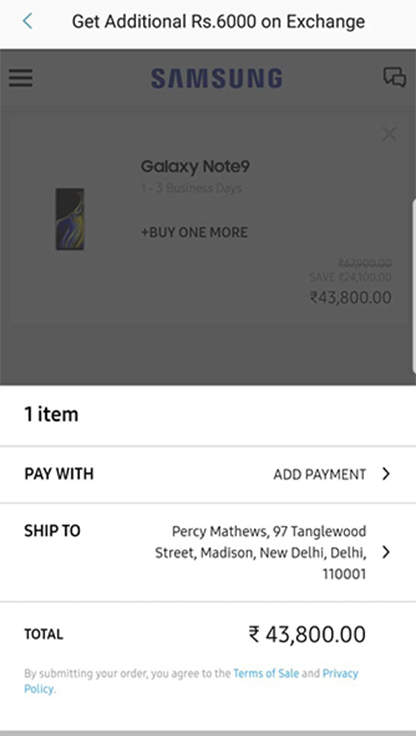 Trading in a Samsung Galaxy S8+ through a Samsung Experience Store, a participating authorized Canadian retailer or carrier will result in a different trade-in value. 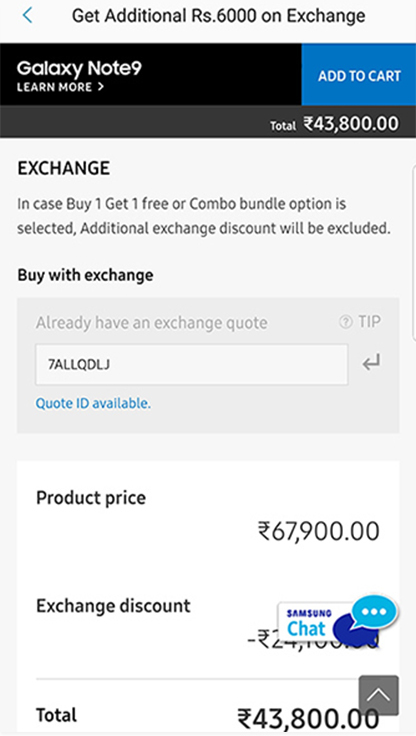 Price or price saving for a Galaxy S10 device depends on, and will vary in accordance with: (I) the particular Galaxy S10 device model being purchased; (II) the model, condition, year and configuration of the traded-in device (which must have a minimum value of $25); and (III) location where the purchase and trade-in occur. 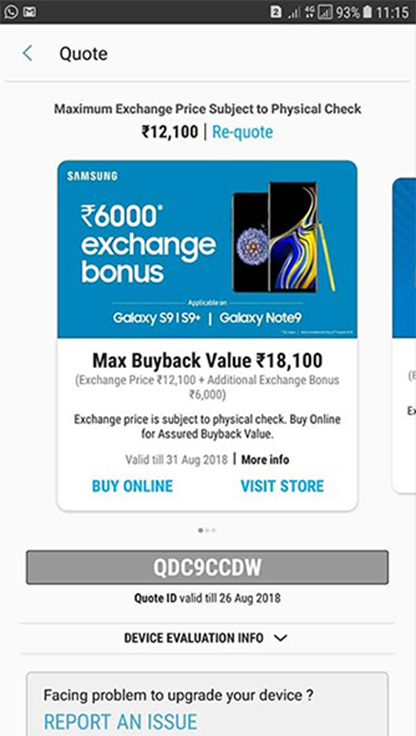 Trade-in values are determined by Samsung Electronics Canada Inc.’s trade-in partners through Samsung.com/ca/ and Samsung Experience Store in Canada in their sole discretion and are final. See full Terms and Conditions available at www.samsung.com/ca/promotions for additional details. 4) Available only at Samsung Experience Stores in Canada and at Samsung.com/ca. Limited to Samsung Galaxy S10 colours and sizes available in Canada. Valid until June 30, 2019. ** Some conditions apply. Offer valid from April 11, 2019 to May 31, 2019. Offer available at www.samsung.com/ca. Purchase from www.samsung.com/ca an Eligible Samsung mobile device with the www.samsung.com/ca financing plan offered by Paybright (“Paybright”) on an 12-month term with 0% interest. This offer requires 12 equal monthly payments at 0% interest. Monthly processing fee of $6.95 will also be waived. An Eligible Samsung mobile device is: Samsung Galaxy S10e, Galaxy S10 and Galaxy S10+ in all models and colours. This offer may be amended or cancelled at any time. Almost done! Before you place your order, take a look at these accessories to go with your new Galaxy. Protection begins the date you purchase and continues for 24 months. We will email you when inventory is added Thank you. After selecting your S10, select an eligible trade-in device incart. Follow the simple steps to determine your estimated trade-in value. Please enter the 15-digit IMEI number of your trade-in device. Does your mobile (screen and / or shell) show pronounced marks of use (scratches, shocks, dents, screen marked)? Is the LCD/Touchscreen non-functioning, have dark spots, blemishes or is the glass broken or cracked? Does the device power up to the home screen and is a factory reset able to be performed? saved if you exit. Exit window? WHAT'S COVERED? Your smartphone is protected by the manufacturer's warranty in the first year after a smartphone purchase and the Plan extends the mechanical malfunction or defect coverage for an additional year. There are no limits for service requests due to mechanical malfunction or defects, provided they are not protected by the manufacturer's warranty. From the time of Plan purchase and for the full term of the Plan, your smartphone is covered for physical or liquid damage. If Device failure is due to physical or liquid damage, this Plan provides for a maximum of two service requests during the term of the Plan.